Softsoap Hand Wash Plus Lotion Giveaway! 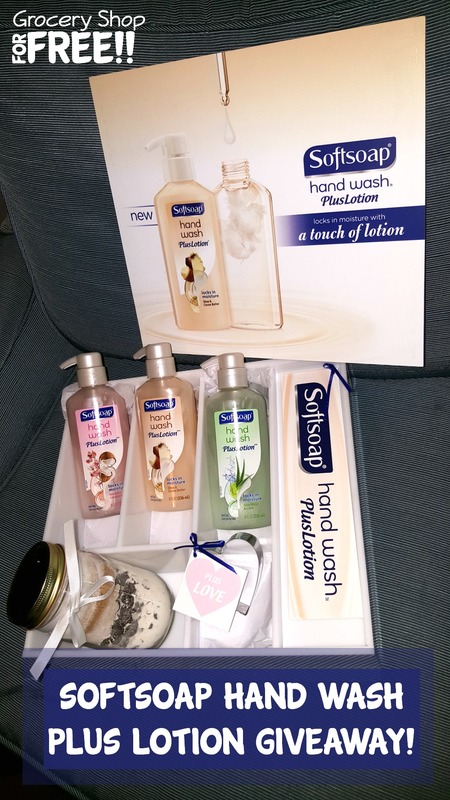 You are here: Home / Sponsored / Softsoap Hand Wash Plus Lotion Giveaway! Have you seen the New Softsoap Hand Wash Plus Lotion? I received 3 to try out. I will tell you that all day with kids, and washing dishes, wiping down counters, and the general washing of hands by the end of the evening my hands feel AWFUL! I really don’t like very many lotions or cremes, they are sticky, too runny, or too thick, they don’t soak in, and usually only last for a few minutes. I was thrilled to get to try this new product since the lotion is IN the soap! Ingenious, right?! This was your hands are holding in the moisture from the water and lotion. My DD swears by putting her lotion on in the shower before she towels off, she says it makes her skin soft and moist for a long time. So, this is the same thing! Frequent hand washing can leave hands feeling dry and uncomfortable. Introducing Softsoap Hand Wash Plus Lotion, a unique liquid hand soap made with a touch of lotion to lock in moisture for clean soft hands. Enjoy the wonderful scent of Aloe Water and Lime and treat yourself to a caring clean. You should start seeing these in the store this month and I am sure we will soon have a coupon to match, so keep a look out for that, too! BUT, that’s not all! They are going to give 2 lucky winners the same 3 bottles I received! To enter the giveaway, leave a comment telling us which of the 3 you are most excited to try! The winner will be drawn at random. This giveaway will end Saturday, February 11th, 2017 at 11:59 pm Central time and the winner will be emailed soon thereafter. Make sure you add [email protected] to your address book, so you get the email if you win! I think I would love to try the Orchid & Coconut Milk. id love to try the lime and aloe soap . i love the lime scent. I think the orchid coconut sounds amazing but they all sound good! I would try them all ! I think the aloe and lime would be great! I would like to try the Shea & cocoa butter!!! I would love to them all. I would love to try the Shea & Cocoa Butter! Thanks for the chance to win!! I love to try the Shea & Cocoa Butter. I would just love to try the Aloe Water and Lime. I would love to try the aloe water and lime! I imagine it would smell nice. I would like them all but think my favorite would be aloe water and lime. I would like to try them all, but if I have to choose it would be Orchid and Coconut. I love shea and cocoa butter smell, id love to try that one first. I would love to win the Orchad and Coconut! I would love to try the orchid and coconut milk and the aloe/lime. I would love to try the Orchid and coconut milk, sounds heavenly! I would love to try lime and aloe! I would love to try the Orchid and Coconut Milk. I would like to try the Orchid and Coconut Milk, but would like to try them all. The Orchid & Coconut Milk sounds heavenly! I am excited to try the SoftSoap Orchid & Coconut Milk Handwash! Thanks so much! I think the aloe and lime would be a lovely scent.